Harvesting of corms (underground stems) of gladiolus is in October. The important point is to extend the growing season as long as possible, but to pull before the soil freezes. Choose a sunny day. Do not dig up the plants that can be trimmed. Partially dry them outdoors before dark. Using a knife or sharp pruning shears, cut the stems and leaves near corms. 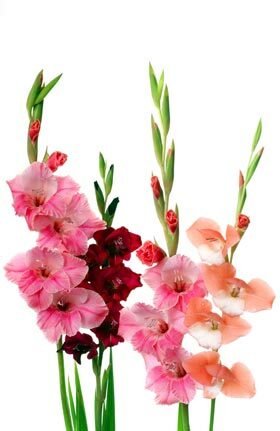 Since insects known as thrips cause considerable damage to gladiolus, it is essential to take special precautions for lifting and storing corms. Before lifting, make boxes with labels in the garden and get Sevin 5-D. Remove first the bulbs from the soil by lifting with a fork on each side of range, then lift the plant with one hand while cutting the stems near the corms with the other hand. Place each variety in a box labeled seedlings. Once a box is full, sprinkle with a little Sevin 5-D, which ensures that the thrips that are in the plantation at the time of grubbing will not lay their eggs on the bulbs. Place the seed boxes filled the basement and let it dry for a few weeks in a warm, ventilated place. When the old bulbs are separated from the new, it's time to clean and store. This usually occurs in December. Clean the old bulbs (corms) and remove the loose skin surface, but not all that husk peel up the outer fleshy part. If you intend to propagate new bulbs, keep all small corms which adhere to the old order to plant the following year. After cleaning the corms must also dust with an insecticide. Proceed by placing a teaspoon of Sevin 5-D in a paper bag than 4 kg. Fill the bag half cleaned corms. Then shake well and remove the bulbs. This amount of 5-D Sevin powder should be enough for 25 corms. Store bulbs cleaned and powdered in wooden boxes to allow air circulation. If possible, place them in a place where the temperature varies between 5 and 7 degrees C.